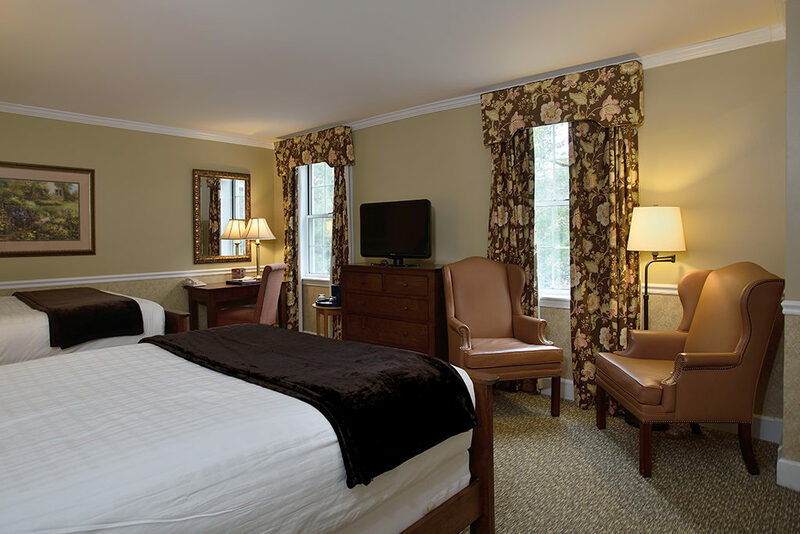 The 100 room Spa at Norwich Inn is situated on 42 country acres. Our grounds abound with well-groomed perennial gardens, spring-fed ponds, a spa courtyard and country scenery. Century-old Oak trees, a reflecting pool enhanced with fountains and an oversized deck compliment the atmosphere of the spa and promote the ultimate in relaxation. 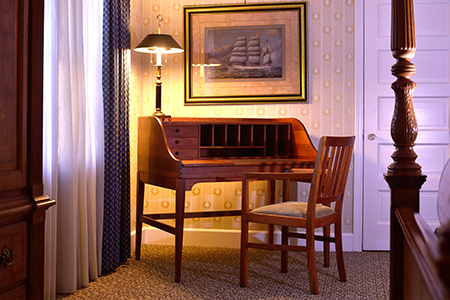 Each of our forty-nine guestrooms has unique characteristics, dating to the Inn’s opening in 1929. The views will delight you: floral gardens, a stately courtyard, an enchanting reflecting pool, and more. 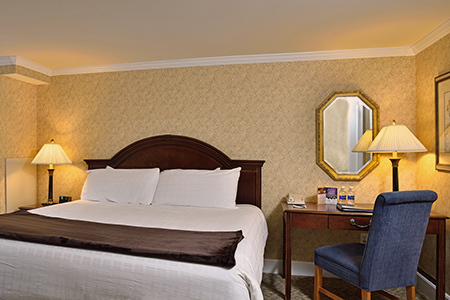 Each of our rooms features elegantly refined décor, plush bathrobes, and a bathroom supplied with spa amenities. 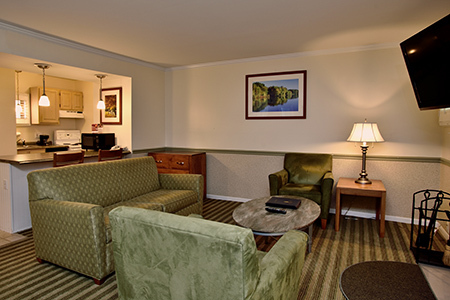 Wireless high-speed Internet service is provided in all our guestrooms. In-room safe for valuables, iron with ironing board and hair dryer are included. 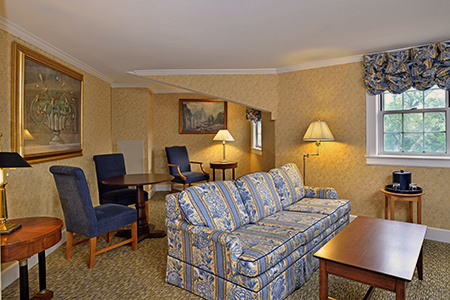 This junior suite with country flair is located in the main inn. 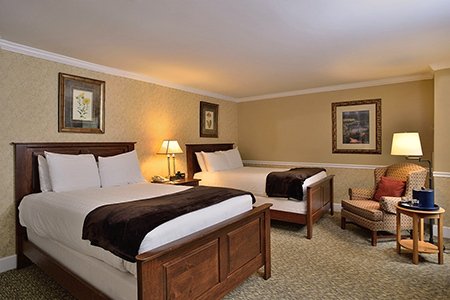 These rooms have a mahogany king size bed and flat screen TV. There is a sitting room with a sleeper sofa, desk with chair, arm chair, coffee table and second flat screen TV. 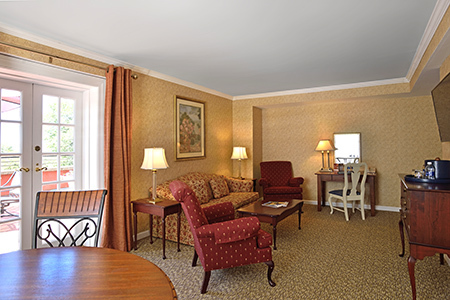 This junior suite with a country flair is located in the main inn. 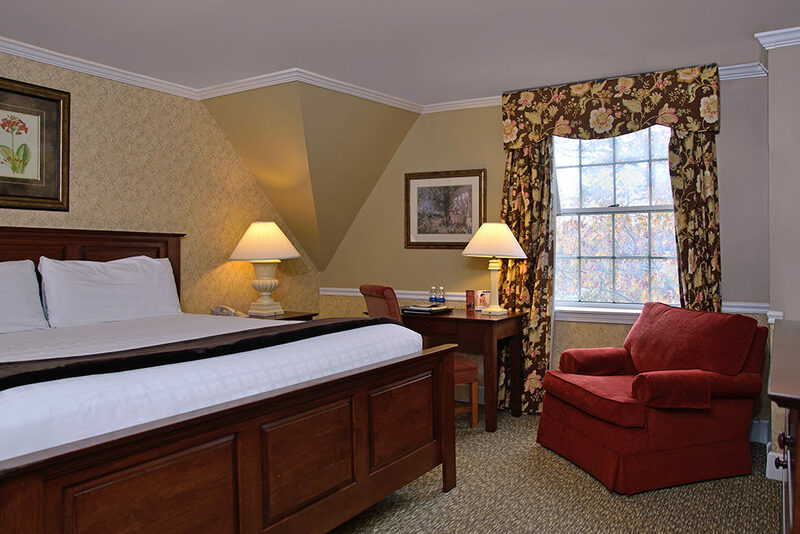 These rooms have a mahogany queen size bed and flat screen TV. There is a sitting room with a sleeper sofa, desk with chair, arm chair, coffee table and second flat screen TV. Two rooms in this room type are ADA compliant. This classic standard king size mahogany bed comes with a flat screen TV and desk with chair. There is additional seating for reading. 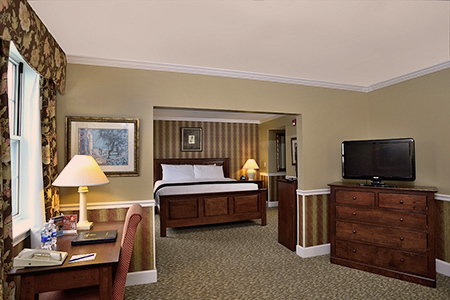 This classic standard room with two double beds comes with a flat screen TV and desk and chair. 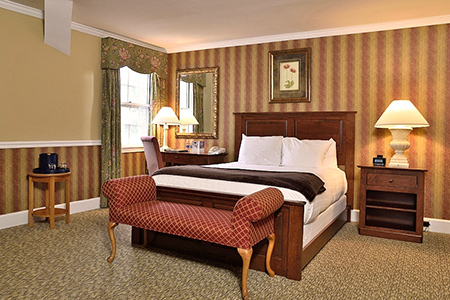 This classic standard room with queen size mahogany bed comes with a flat screen TV and a desk with chair. 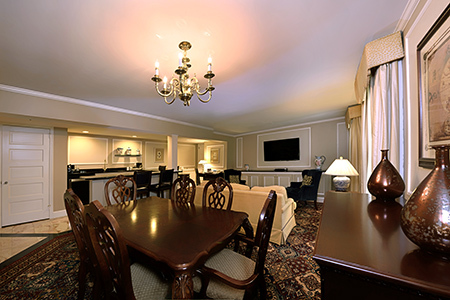 This very private suite is a great getaway location overlooking the spa courtyard. 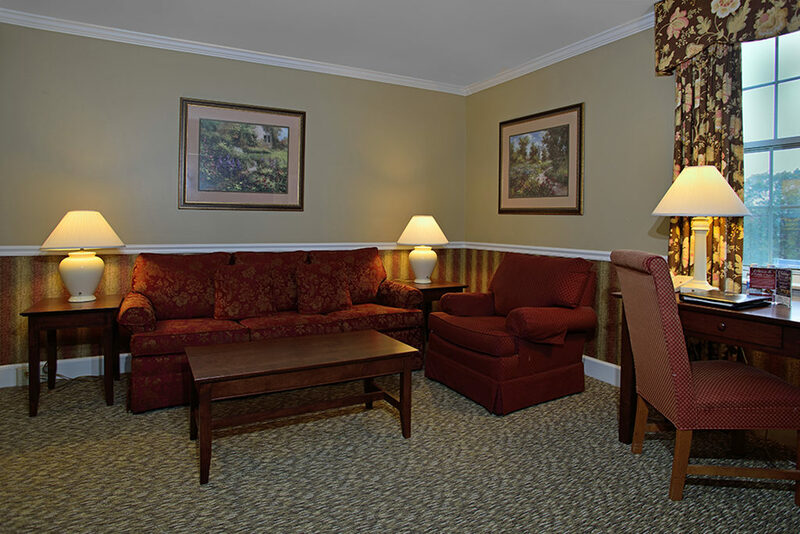 The unique layout provides a living room full sleeper sofa, flat screen TV, and an adjacent dining area. The bedroom includes a king size bed and armoire with a flat screen TV and incredible views of the reflecting pool and 17th tee of the golf course. The suite reminds us of the architecture of 1929. 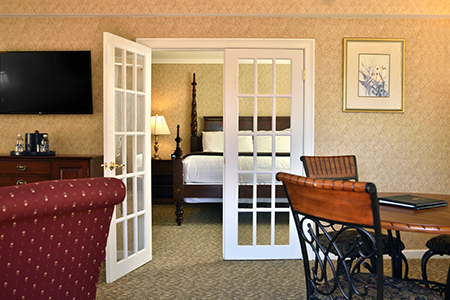 The most requested room in its day, this suite has its original curved window, which mimics the front entrance of the Inn. 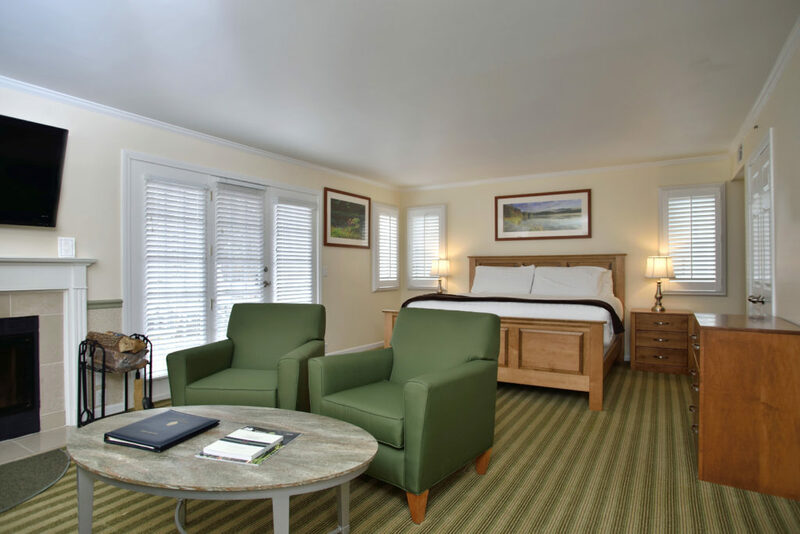 Surrounded by windows, this suite offers perfect views overlooking the rock gardens and fishpond at the entrance to the Inn. It has a sitting area with full sleeper sofa, arm chair, flat screen TV, plus a small dining table. 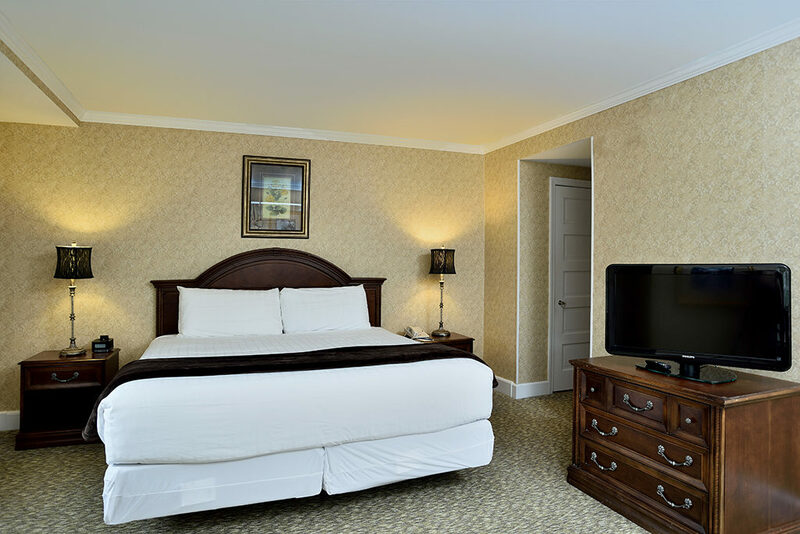 The bedrooms area includes a king size bed and second flat screen TV. There are two full baths. This suite offers stunning views from its beautiful brick terrace deck overlooking the spa courtyard, reflecting pool and the 17th tee of the golf course – perfect for entertaining small gatherings or simply enjoying the views in private. The bedroom has a four poster king size bed and armoire with TV. 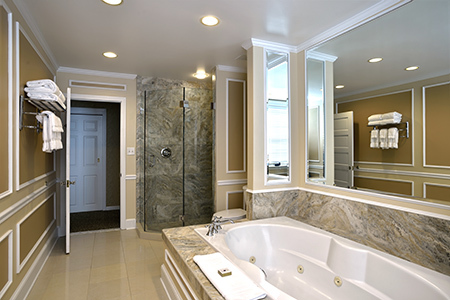 The bath is over-sized and includes a Jacuzzi tub and separate shower. The living room has a full sleeper sofa, arm chair, desk with chair, and a flat screen TV. 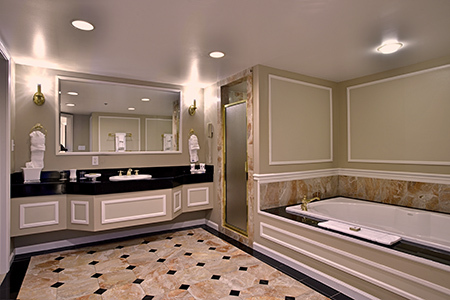 This luxurious two room suite has a king sized bedroom with an oversized marble bathroom including a two person Jacuzzi tub, separate shower and double sinks with full amenities. The living room invites you to relax on the overstuffed full sleeper sofa and chairs while watching television or entertaining guests at the dining room table while enjoying beverages from the bar. 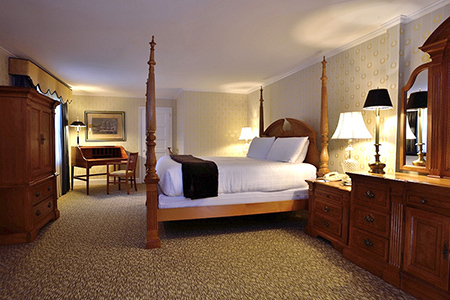 A standard room with two double beds adjoins the Windsor Suite if required at an additional charge. Our condominium villas offer the ultimate in privacy. Each villa features a full bath, a galley kitchen, a private balcony, and a living room with fireplace and sofa bed. Villa studios include either one king or two double beds, and are splendidly decorated. Duplex units afford expanded functionality, featuring a queen loft bedroom with second full bath upstairs, and a pull-down Murphy bed and full dining area downstairs. All rooms have wireless high-speed Internet service, an in-room safe for valuables, iron with ironing board, clock radio with CD player, and hair dryer. 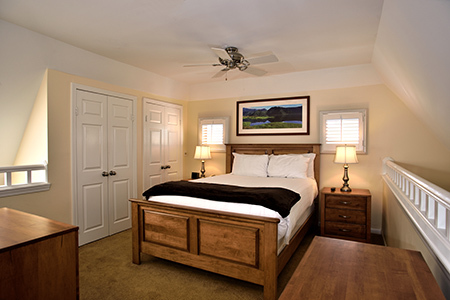 Located in the Villa complex on the grounds of The Spa at Norwich Inn, the duplex units have an open loft with queen size bed and full bath. Downstairs there is the kitchenette complete with refrigerator, small stove, microwave and coffee machine. Basic kitchen pans and dishware are included. The living room has sofa (sofa bed), chairs and a fireplace that is used mid-October until Memorial Day. 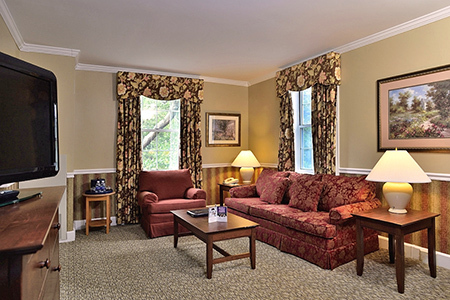 Next to the living room is an open area with a queen size Murphy bed in the wall and second full bath. There is a television both upstairs and downstairs. 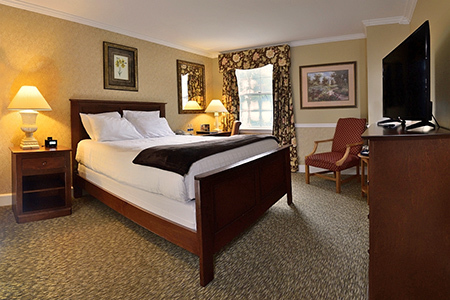 It is an easy walk to the main inn and near the outdoor pools. 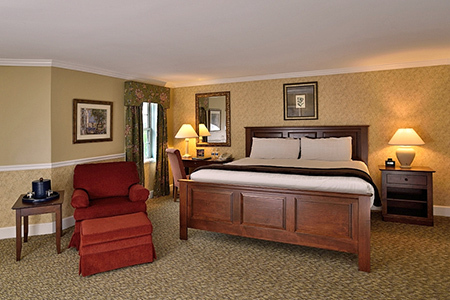 These rooms are available both non-smoking and smoking. 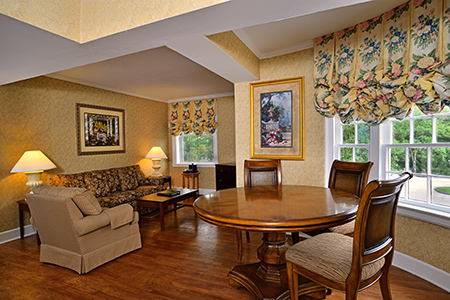 Located in the Villa complex on the grounds of The Spa at Norwich Inn, these studio condominiums come with either a king size bed or two double beds. The kitchenette is complete with refrigerator, small stove, microwave and coffee machine. Basic kitchen pans and dishware are included. Living room has sofa (sofa bed), chairs and a fireplace that is used mid-October until Memorial Day. Each unit has a small balcony. Televisions are in the bedroom. 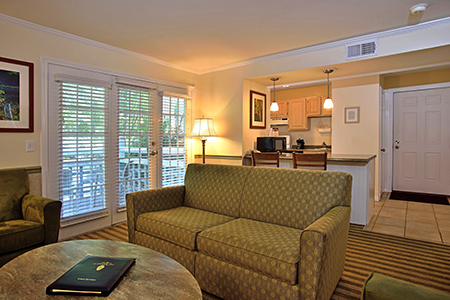 It is an easy walk to the main inn and near the outdoor pools. 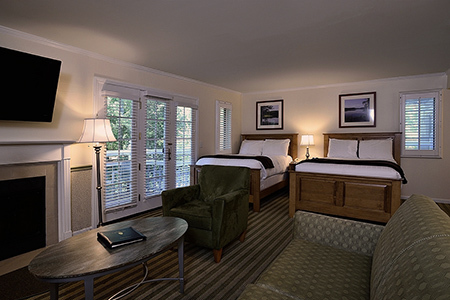 These rooms are available with either a king size bed or two double beds.